Disney Cruise Line announced today that prices are increasing for meals at its adults-only venues, Palo and Remy, for all meals and for massages on Castaway Cay. 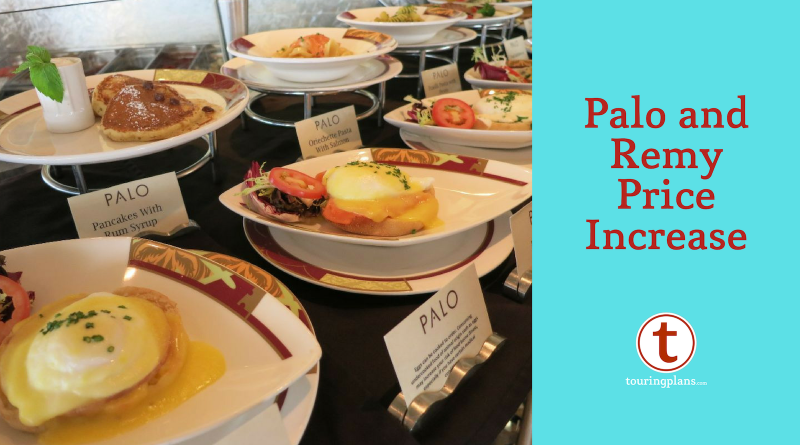 Brunch and dinner at Palo (all ships) will increase from $30 to $40 for reservations booked December 14 or later. This means if you sail after the 14th but have already made your reservation, you will be charged the old price. At Remy (Dream and Fantasy), brunch will go from $60 to $75 and dinner from $95 to $125. Again, the price you’re charged is based on when you made your reservation, not on your sail date. The last price increase for these was in 2016. Platinum Castaway Club members get one free meal at Palo each cruise. A massage on Castaway Cay goes up to $147 from $118, and a couples massage from $220 to $294. More Disney Cruise Line information is at our dedicated DCL section including why we still think these two meals are a great bargain. Remy Dessert also went up, from $55 to $60/person.